What are the best industrial shelving units? The industrial environment is unlike any other which means any shelving being installed needs to be able to withstand the tough demands placed upon it. Shelving styles that work well in the home or in an office won’t necessarily be the best option for your warehouse or industrial space. 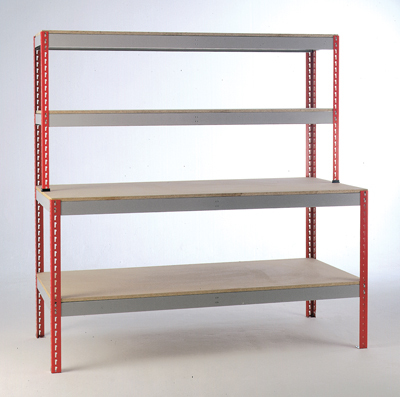 Below are some of the best and most popular industrial shelving units currently in use today. Not only can it be in place very quickly but it allows you to attach it to the wall to strengthen and reinforce its rigidity. Businesses tend to invest in rivet shelving as it can be expanded upon as and when needed. This enables you to grow while keeping the style uniform and in line with existing shelving. Single rivet shelving uses low-profile beams to form the shelf frame. This allows the vertical space between each level to be maximised making it perfect to store multiple smaller items. Compared to other systems, wiring shelving collects very little dust and only requires the occasional quick wipe down. They are also rust resistant which is a huge advantage for longevity. Depending on the layout of the warehouse, the open nature of wiring shelving will make the retrieval, storage and rotation of products extremely easy to do. Whether you want to have it wall mounted, with tilt shelves or with any number of other variations, wire shelving gives you the adaptability you are looking for in a storage unit. Compared to rivet shelving it offers more options to adjust the system to suit. The compression clips that come with steel shelving make this easy to do. Steel shelving usually comes with add-ons such as dividers, doors, drawer inserts and bin fronts. The actual shelving can be clipped into place in any direction you want. If fits into warehouse and industrial environments as you’d expect, but steel shelving can also be used in commercial spaces and offices, without looking out of place. Not only is it easy to build and quick to put in place, but it can also be taken apart just as fast so it can be manoeuvred anytime time you want. The unit arrives with wielded frames and good capacity for storage of smaller items. This ensures it remains durable and is purchased at a far lower price point compared to some alternatives. The shelving can be easily adjusted if required. The system comes with good depth and height variety to allow you to find the right combination to suit your products and goods. If your not sure which is the best industrial shelving units for you get in touch. This is what 2h Storage Solutions do. They are storage experts and are best for supplying industrial shelving units and racking.